The wait staff paraded through the restaurant, winding their way between tables, until they arrived at ours. With a flourish one snapped open my napkin, while another presented the main event. Suddenly I was looking eye to eye with an entire baby pig; legs, snout, tail, the whole thing. I was not a vegetarian, but this might make me change my mind. Segovia, Spain is famous for its superb suckling pig. The travel book recommended that this was the best place in the country to try the delicacy. Reservations were required days in advance, so that they have time to prepare the meal. The earliest reservation possible was for 8 p.m.. I am usually in bed by 8, not just starting dinner. But plans were made, and off we went. We strolled through the town, marveling at the ancient, remarkably intact, Roman Aqueduct. The main plaza sits directly beneath the arches of the aqueduct, with lights illuminating each section. As we made our way to the restaurant, I saw a sign that made my eyes light up and my heart happy. It said “lana” which means wool. Bingo! I had found a yarn shop. I like to purchase local yarn from the places we visit. I tried to tell the proprietor what I wanted. She told me a great deal about the yarn, only about half of which I understood. Apparently 3 years of college Spanish was wasted on me. What I did learn was that the sheep in Spain are legally protected and never allowed to “marry” other types of sheep, thus keeping the Merino breed pure. Yarn spun from Spanish wool is made from a centuries old tradition, and considered to be the best Merino wool in the world. Did I mention that we had dinner reservations? I could have stayed in the shop forever, but my stomach was beginning the grumble, and so were my travel companions. I made my purchase and waved goodbye. We were prompt for our reservation, and we were the only people in the whole place. It seems that no self respecting Spaniard would be seen eating at this alarmingly early hour. Shortly after we were seated another group entered the restaurant, Americans as well, obviously. We were introduced to our waiter, the chef and the wait staff, before the meal began. The courses come out slowly and beautifully. Finally with fanfare, our chef brought out the reason we were there, the suckling pig. As the main event was being carefully sectioned, we learned that the pig must be precisely 21 days old, still suckling, to be the most flavorful. We began to break into the meat, and I do mean break. The skin had the consistency of a hard cracker and it literally snapped and broke apart. After just one bite, I understood what the excitement was all about. This was absolutely the most flavorful meat I have ever had the pleasure of tasting. I was back on team carnivore. A couple of hours later our tummies were full and our heads buzzed from the wine. We made our way back to the hotel, and along the way we passed my yarn shop. Suddenly I remembered that I had bought some, but where was it? In a panic I started to check my pockets and purse when Hubby held up the bag of yarn and said “Are you looking for this? You left it under the table.” I blame the wine. We ended the evening sitting at a sidewalk cafe, mesmerized by the lights shining on the aqueduct. We sipped coffee, ate ice cream and listened to the sounds of the street. Children ran and laughed as they played in the plaza. A couple kissed passionately beneath the arch, wrapped in the warm night air. I felt completely at peace, grateful to be in exactly the right place, at exactly the right time. 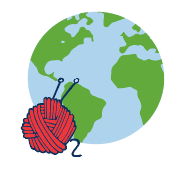 If you crochet, and if you are a masochist, below is a link to the work of an amazing person. I do not know who the designer is but she has provided instructions for making, out of yarn, the Segovia aqueduct. No, I will not be trying this, I salute her!